Interestingly, X-rays were discovered soon after the first chiropractic adjustment in 1895. 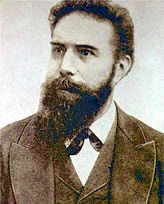 Wilhelm Conrad Roentgen, a German physics professor, was experimenting with cathode ray tubes and discovered that an object across the room began to glow. Much to his surprise, when he placed his hand between the tube and the glowing barium screen, he was able to see the bones of his hand. We refer our patients requiring x-rays to radiology labs that take medical HD (high-definition) digital x-rays (not requiring film) that produce sharper images with lower radiation exposure emissions when compared to older film x-ray technology. Whenever possible, our x-rays are taken in the standing position (weight-bearing) so that we can assess your spine, joints and posture properly. We use all required shielding and protection for your safety. Click here for study, "What Patients Want to Know Before Having an Imaging Exam... Are patients most concerned about radiation? A study found the answer". Based on the nature of your condition as well as a number of other factors, x-ray studies of your spine or injured body part may be indicated. Chiropractors receive over 300 hours of x-ray studies in college prior to graduating. They are also tested on these procedures in their board exams. Dr. Pisarek is fully trained and certified to take radiographs and identify abnormalities of the spine as well as more serious pathologies. cost effective way to view the structure and general condition of the spine, as well as the other joints of the body. They reveal the true condition of spinal regions, illustrate abnormal areas of stress, and expose areas of degenerative variation. This provides essential information, which your chiropractor integrates with your history and examination findings to render your diagnosis. Diagnostic X-rays allow for accurate biomechanical analysis and individualized, effective treatment plans. X-rays are also useful in assessing the appropriateness of chiropractic care as they can help to rule out the existence of more serious pathological processes such as spinal fractures, tumors and infections, which require immediate emergency medical intervention. While prolonged exposure to radiation can be potentially harmful to the human body, the diagnostic x-rays utilized by Dr. Pisarek at Advanced Healthcare pose a minimal health risk. In fact, according to radiation guidelines for diagnostic x-ray studies, it would take more than 300 full spine x-rays performed by a chiropractor for these guidelines to be met. We only take necessary and specific x-ray views: eliminating unnecessary x-ray exposure. We refer our patients requiring x-rays to radiology labs that take medical HD (high-definition) digital x-rays (not requiring film) that produce sharper images with lower radiation exposure emissions when compared to older film x-ray technology.. Shielding and filtration: block or reduce the x-ray beam from affecting sensitive tissues and areas of non-diagnostic interest. Rare Earth (intensifying) screens: can cut x-ray exposure by 50 percent. Collimation: narrows the x-ray beam to focus on specific anatomy. Grids: reduce scatter radiation, and improve image contrast and quality. High speed film: lowers exposure time by up to 1/12th compared to hospital x-rays. Increasing kilovoltage & minimizing milliamperage: further reduces x-ray exposure. Minimal exposure time: as small as 100ths of a second. Regular changing of processor chemicals: give high quality, diagnostic films.